The artist’s oeuvre is a combination of artistic genres and techniques encompassing sculpture, performance art and photography, whilst it also simultaneously addresses important issues in today’s society as well as the various political controversies in China and world-wide. At first glance, the photographs seem to be merely of an unusual landscape, sometimes easily unidentifiable, sometimes not. However, upon closer inspection an outline of a man appears, standing within the setting. This figure is unnerving and begs the questions – what is he doing there? What is the symbolism of this character and what is his purpose of blending himself into the background? This figure is of course the artist himself, who is ‘Hiding in the City’, thus becoming ‘The Invisible Man’. 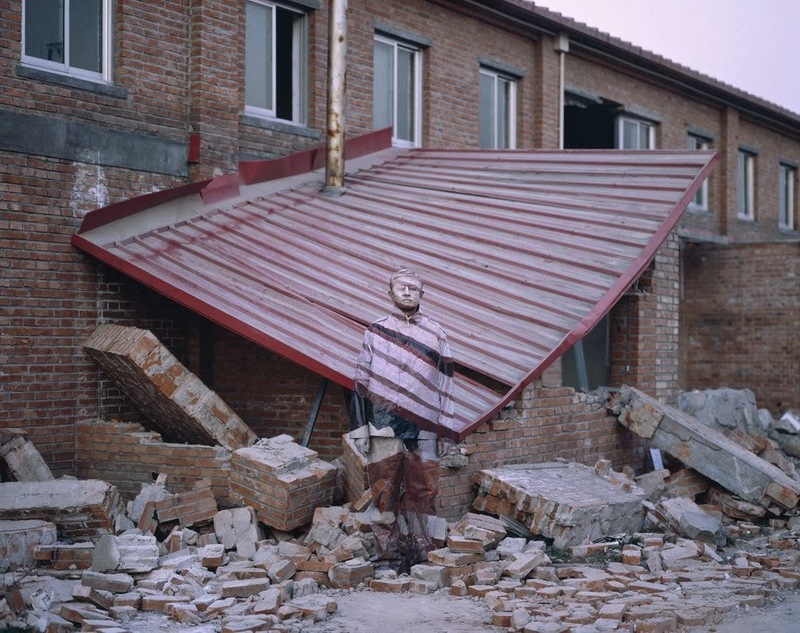 The artistic motivation for the production of these series dates back to 2005, when the Suo Jia Cun (Beijing International Art Camp), was demolished by the local government. 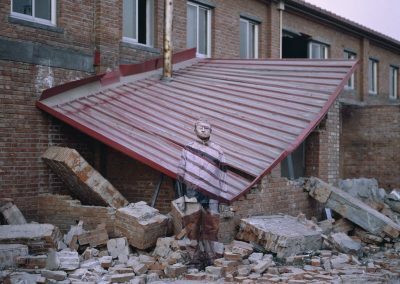 As a member of Suo Jia Cun and one of the artists whose studio was destroyed, Liu Bolin felt it his duty to protest against such ruination which occurred without warning from the police. However, the contemporary political climate being what it was, certain forms of protests were and still are simply prohibited, and thus the artist came up with the ingenious methodology that he still practices till this day. Incredibly, no digital superimposition, nor any digital altering is made by the studio or artist. Integrating into the chosen landscape can be interpreted in a number of ways. Primarily, it allows for an objection to the current political climate or societal issue whilst maintaining a level of anonymity. 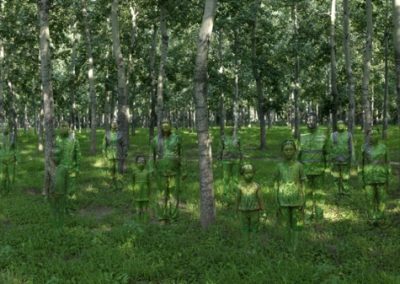 For concerns such as the environment or global warming, which Liu Bolin has also expressed through his work, this also means that the focus of these concerns precedes the individual impact of these problems on the artist as well as the member of the audience. “From my perspective, the meaning of human beings has been constantly annihilated in modern society. In the rapidly developing course, while living environment is improving, people are effacing themselves; what a great contradiction! I choose to hide in different backgrounds because each one has its own significance.” In a way, the artist manages to question the inter-cancelling relationship between our civilization and its development in a highly accessible manner. Additionally, his work can be seen as a metaphor for the condition of today’s society, who feel invisible to the greater powers of the government, environment, consumerism and urbanization. Liu Bolin notes that “… In China, people have maintained the red-themed uniformity lifestyle for a long time, especially common people. They have even injected the uniformity of behavior or thinking into their blood”, but the same can be said for any other country and place. To what extent can our plight be heard? 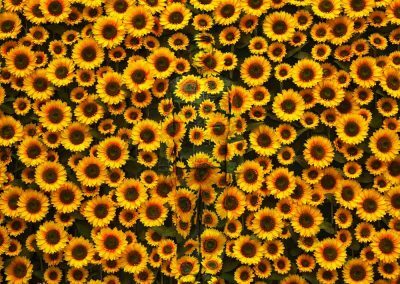 To what extent can we identify ourselves within a similar situation or in an analogous landscape? Would you be able to recognize yourself in a place where forces outside yourself thrust you into the background? All these questions and more were answered by the artist himself, when he made a special appearance at Erarta Museum for the press opening on the 15th of February and vernissage the day after. 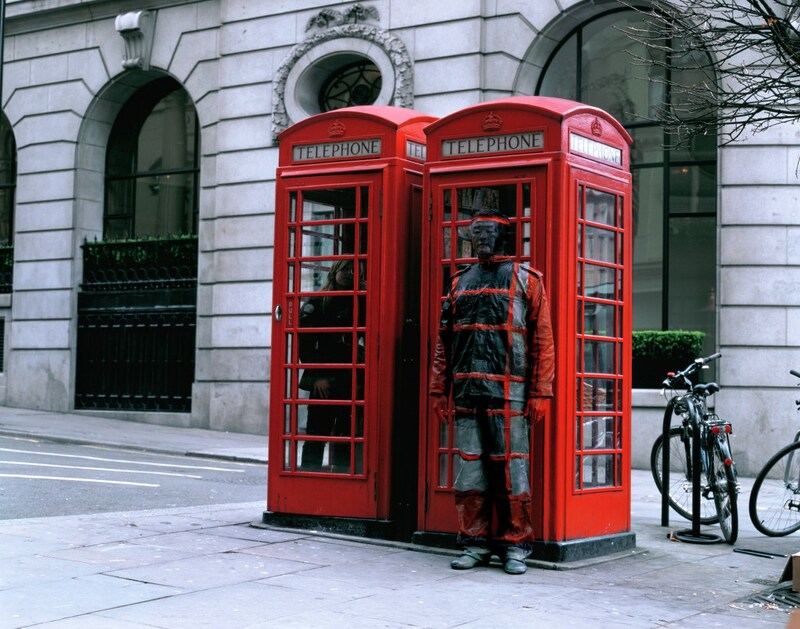 During his stay, Liu Bolin also “hid in Erarta”, blending himself into the background of the museum. Besides, for the public view the artist hid the volunteers into the chosen background, showcasing his methodology and process, making the invisible- visible. Liu Bolin also held a press conference during that time. Erarta Museum expresses particular gratitude to Moncler as Exclusive Partner of the exhibition. Moncler since ever, supports art and creativity as cardinal points in the brand’s philosophy. 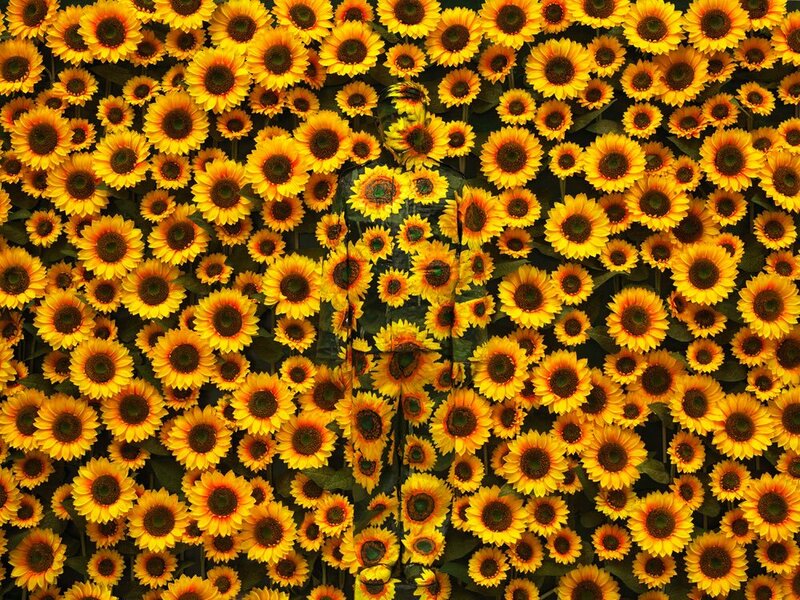 Moreover, the Brand counts a partnership with Liu Bolin, as the hidden protagonist of Moncler’s latest advertising campaigns where the artist encouraged a dialogue between art and nature. This exhibition has been made possible through the collaboration with Galerie Paris-Beijing.